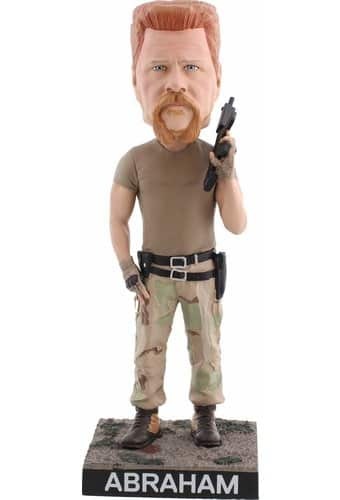 This The Walking Dead Abraham bobble head is part of Royal Bobbles’ collection of entertainment. This collection features icons in pop culture whom we all love and cherish. Abraham is genuinely self-aware and living the post-apocalyptic life he wants, doing what he has to do to create that life for himself — even if it meant hurting Rosita. Having truly found what he wants, he now faces a life full of conflict and compromise, if he even gets to lead it. With his iconic Abrahamisms and often crude sense of humor that splits the tension in the show, you can’t help but love his character. With a tragic backstory, including being traumatized by the death of his family, he suffered from PTSD and had reckless suicidal tendencies that kept us on our toes. Although he may be unstable, he is often able to share wise council with others and think toward the future. This model is crafted with extreme attention to detail and is of the highest possible quality. It shows Abraham in his camo pants and tan shirt, sporting a gun holster on his belt. He is also carrying an Uzi. If you’re a fan of the Walking Dead series, this bobble head is the one for you. All Royal Bobbles bobble heads are about 8” tall and are made from highest quality, heavyweight polyresin. Each bobble head is hand painted, making each one unique. Each Royal Bobbles product comes with its own unique serial number on the bottom of the base to indicate authenticity.